Django Girls is a rapidly growing initiative that aims to bring more women into world of programming. 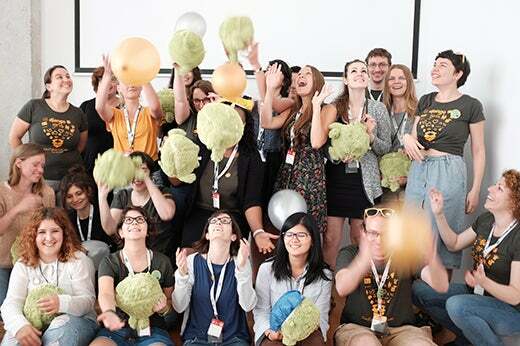 It started a year ago at EuroPython 2014, and since then Django Girls workshops have been held all over the world. In just a year, more than 1,600 women learned about Python and Django during the workshops and many, many more did it at home by reading their open source Django tutorial. The organization grew from just two people to hundreds of organizers, contributors, and coaches. From Canada to Australia, the Django Girls were everywhere. You can learn more about the program by listening to this year's EuroPython 2015 keynote by myself and Ola Sitarska. I talked to Mikey Ariel, who graduated from that first workshop at EuroPython 2014 in Berlin last summer and continued on to organize the first Django Girls Brno workshop and Django Girls EuroPython 2015 workshop in Bilbao, Spain. She is an amazing person that makes a room lighten up whenever she enters it. She dances, smiles, and gets things done. Following Mikey's blog post about the workshop published in our Django Girls blog, we were happy to hear her insight into how workshop organizers nowadays feel about our program and about the workshops that they organize. Why did you decide to organize the Django Girls workshop at EuroPython in Bilbao? When I applied for the workshop in Berlin, I knew that my main take from it would be to learn how to organize workshops so that I can help facilitate this opportunity for as many women as I can. I also knew that I'd like to focus on conference partnerships, because I felt that they have a bigger potential than a standalone local workshop to integrate these newcomers with the open source community as quickly as possible, and I felt that I could leverage my existing conference involvement to coordinate both the workshop and the integration of the workshop into the conference. After organizing the Brno workshop, co-located with DevConf.CZ, I was chatting with Ola about EuroPython 2015, which I was planning to attend. She mentioned that because of the keynote you wouldn't have time to organize a workshop, and having just completed a successful conference partnership I knew that I should help out. My "help" turned out to be serving as the main organizer, but thanks to my trusted co-organizer from the Brno workshop and fellow Red Hatter Petr Viktorin, as well as support from the EuroPython organizers, I knew I could go for it! What is your fondest memory from the workshop at EuroPython? This picture was taken after we made the closing announcements and thanked everyone, and at the time of day when most of our participants finished their websites so they were tired enough not to worry about being silly but proud of their achievements, hence the big smiles. It marks the end of a steep learning curve, but also the beginning of what we hope will be a new, geeky chapter in their lives. Also, Android plushies. There was one moment when I feared the fate of the workshop. The first one was during the 24 hours that followed the Python en español podcast controversy, which sent the internet into a frenzy of tweetstorms and blog posts calling for much needed resolution on behalf of the EuroPython organizers. Our workshop was announced not even two weeks prior to that incident, and already we had to face the possibility of withdrawing from the conference. Thankfully, the EuroPython organizers took the action that was expected, and we published a statement on our blog that addressed the issue and resolved to hold the workshop as planned. It was a very stressful day with lots of Slack meetings and pacing around the office, but I think it made us stronger and more resilient, and also strengthened our mission to expunge such behavior from the IT communities. Compared to the workshop you organized in Brno, how was the Bilbao workshop different? Organizing a workshop remotely was probably the difference that made the most impact, and in my discussions with the Django Girls support team during and after the workshop, we realized that it's critical to have a local organizer or ally that can help with promoting the workshop among local universities, tech communities, and companies, even if the conference itself is international. When Petr and I organized the workshop in Brno (where we live) along with Lenka Moutelikova, another graduate of the original Berlin workshop, we rarely needed to rely on the DevConf.CZ organizers because not only did we have local connections through Red Hat's university outreach program, but Petr and Lenka both speak Czech and could communicate with vendors and organizations. The Czech Republic is also very fortunate to have local chapters of PyLadies and Rails Girls, as well as Czech groups like Czechitas, who were happy to help extend our reach to potential candidates. Naturally, we had none of these advantages with the Bilbao workshop, and the EuroPython organizers (there are only 6 of them) had a 1,000-person conference to worry about, so even though they were willing to help, they were limited by their own commitments and priorities, which is totally understandable. Cross-promotion via the EuroPython website helped us to reach out to some international participants, but ended up leading to a flood of extremely overqualified applicants who sought financial aid for EuroPython. We had to make a decision to downsize the workshop from 30 participants to 20, and following some cancellations we ended up with 15. This number turned out to be optimal for the conference logistics, room requirements, and general atmosphere. We managed to provide financial aid to everyone who needed it, and we had a tight-knit group of unique women from very diverse backgrounds from the U.K., Denmark, Italy, Greece, and other countries, as well as some local Spanish women (despite our limited local promotion). Would you organize it again? Next year? Maybe with a local main organizer ;-) To be honest, I would much rather see our Spanish graduates take on next year's workshop, as ultimately it's their local community that they'll want to grow. From what I hear, they're already making their first steps in organizing local workshops in various cities in Spain (good luck, ladies! ), so hopefully by next year the community will grow to the experience level needed to plan the next EuroPython workshop. In general, Django Girls as a global program puts an emphasis on building local support networks for women who want to get involved with IT, so I feel that the day is upon us where we won't need to reach out to the ends of the world to draw attendees to our workshops by means of international conferences, as more women become empowered and motivated to dive into technologies like Django, Python, Ruby, and the likes. What would you say to first-time workshop organizers? Any tips? Other than the standard Don't Panic(™), I'd say that if you're thinking of a conference partnership as your first workshop organizing experience, be prepared for some extra work. Even if you have previous event organizing experience, you will basically be a liaison between two events, each with their own requirements, priorities - you coordinate both the workshop and the integration of the workshop into the conference. Local, standalone workshops are a wonderful way to learn the ropes of organizing events, and you can create a wonderful experience for your local communities with very little money or logistical trouble. That being said, if want to go for it, you absolutely can do it with some forethought and a bit of extra organization. The Organizer Manual is brilliant for planning any workshop, and it now includes a Conference Partnerships section with some basic tips and tricks for such workshops. Reach out to one or two other Django Girls graduates, coaches, or allies, and form yourselves into a team with clear role separations. Make sure you have a single point of contact in the conference, if possible, to minimize communication breakdowns. And remember to have fun! These workshops are positive, exciting, and important for every woman that participates, and to be a part of that community is an honor (and lots of fun! ).